How does slow-cooker mushroom lentil ragu with vegan herbed ricotta and kalamata olive tapenade sound? I know I'd love to come home to a buffalo chickpea-stuffed sweet potato with celery slaw and vegan blue cheese at the end of a long day. Oh, and don't forget brownie cupcakes with salted caramel icing! Just because Nourish is designed for a healthy, balanced plant-based lifestyle doesn't mean you can't have decadent treats. In fact, one of their specialties is BREAKFAST COOKIES, y'all. If you're bracing for cost, don't worry; prices are $12 for individual meals and $20-27.50 for family meals, so the cost is definitely on par with—and waaaay healthier than—grabbing something on the way home from work. Plant-based meal prep services like Nourish are perfect for busy individuals and families (especially ones new to vegan living), as well as anyone who struggles to maintain good eating habits in the face of quick and easy options or likes to have systems in place so they don't have to count calories. 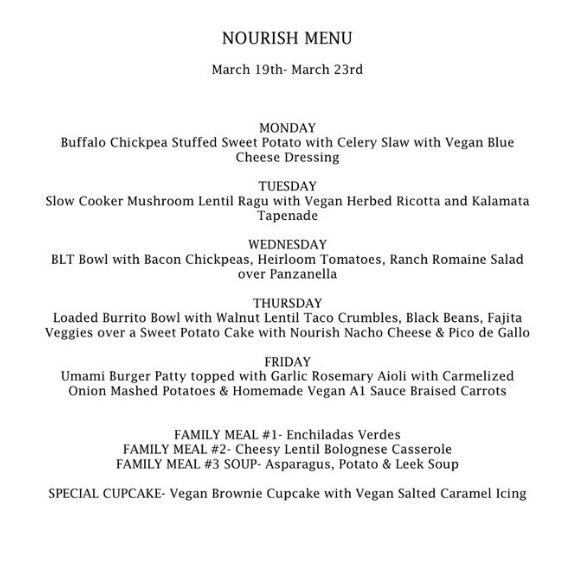 Nourish releases a weekly menu with meals for Monday through Friday, and you can order and pay online. There are rolling order deadlines for individual meals (5pm on Saturday, Monday, and Wednesday), so if you remember on Monday that you need a few things for later in the week, you can just hop on the website and order them. Family meal orders, which require more prep, are due by Sunday at 5 pm. Then, you can pick up your fresh, refrigerated meals at the VIVE Studio at Cedar Bluff Racquet Club Monday through Friday from 3pm - 9pm (or the next day after 8am), or have your order delivered for a flat fee of $3.99. In the near future, they'll also be changing pickup times and adding distribution sites. Nourish offers a few ongoing promotional discounts, including 15% off a month of meals (one meal a day, Monday to Friday, not including family meals and baked goods). If you're ordering for two people, you can get 10% a week of meals for two. Group pricing is also available for most meals. Back to what we all want to talk about—the food! Founders DeeAnn Bower and Jason Dean have a simple philosophy: Give your body what it needs to do its job and it will naturally rid itself of the things it does not need, like toxins, waste, and excess weight. To that end, Nourish creates meals that are 90% "label free," with whole foods, little to no oils, and only occasional ingredients that are minimally processed. And for dessert, you can add on “Those Cookies” (vegan chocolate chip), vegan cupcakes. 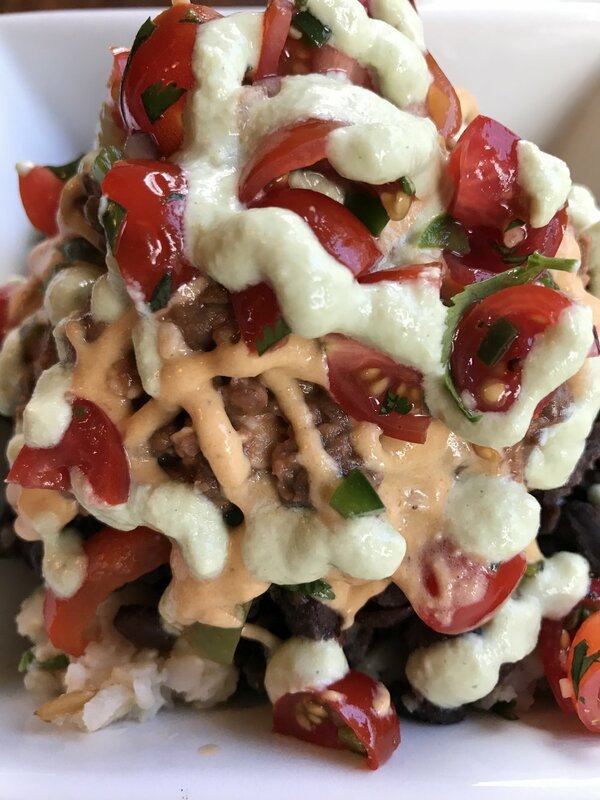 If these flavorful meals seem at odds with healthy eating, that's only because, as DeeAnn points out in her blog, veganism has frequently (and wrongly) been marketed as a restrictive diet. Plant-based eating is not a diet but a return to how we are designed to eat natural whole foods without rules or restrictions. To reduce our health and plant-based eating to just another weight loss formula or diet will undermine our desperate need to eat a volume and variety of real whole foods to treat, prevent and reverse obesity and diet-related disease and sickness. A former college basketball player, DeeAnn had a long and successful career in fitness before discovering the vegan lifestyle. "For 15 years, I practiced and preached the high protein/low carb diet and a full body weight training workout that focused on progressive overload and high intensity cardio," she explains. "I had just come off my most intense diet prior to deciding to go plant-based. My best friend was plant-based and after I did the research, it made sense and I decided to try it. That was 3 years ago. I know without a doubt that this is how we are designed to eat." Based on her experience, DeeAnn began recommending a vegan diet to her clients, but saw that there was a real need for prepared meals made from whole foods with no hidden ingredients. She worked with her partner Jason to develop Nourish, and he jumped in with both feet to hone his plant-based culinary skills and develop a menu that not only reflected their philosophy and values, but would be satisfying and enjoyable for anyone and everyone. DeeAnn also operates VIVE Academy, a nonprofit organization though which they offer a whole-person health and wellness program called VIVE Alchemy. Providing plant-based meals and vegan treats supports the mission of their health and wellness process as well as the local vegan community as a whole. In her words, "We practice, cook, sleep, live, breathe and preach this stuff!" Ready to give Nourish a try? Just visit VIVEalchemy.com. You can keep up with VIVE on Instagram, Facebook, and Twitter, and visit vivealchemy.com for more information and to order meals.